• The Group’s results come on the back of revenues growth, with gross income up 6.6% to €8,767 million, driven by the strong performance of core banking revenues (€8,217 million, up 4.2%). Net interest income grows 3.4% to reach €4,907 million. • Noteworthy reduction in non-performing and non-core assets: non-performing loans drop to €11,195 million (down €3,110 million in the year), while the NPL ratio falls to 4.7% (6% at December 2017). • Customer funds grow to €358,482 million (up 2.6% in 2018, or €9,024 million). The performing loan book gains 1.8% (up €3,808 million) to reach €213,962 million, with growth of 6% in loans to businesses. • The Bank reaches adequate profitability levels to cover the cost of capital. The Group’s ROTE climbs to 9.3%, while recurring ROTE from the bancassurance business reaches 12.3%. • In 2018, CaixaBank has consolidated its leadership in both retail banking and digital banking, cementing its number one status in long and medium-term savings products and making further progress towards digitisation and transformation. Sale of the real estate business (mainly the portfolio of real estate assets classified as available for sale at 31 October 2017, as well as 100% of the share capital of Servihabitat) to a newco owned by Lone Star and CaixaBank (80% and 20% stakes, respectively). Agreement to sell CaixaBank’s 9.36% stake in Repsol. After the early settlement of two equity swap agreements, a disposal programme for the remaining stake in Repsol has been initiated. CaixaBank closed 2018 with a 100% stake in BPI. The Portuguese securities market regulator (Comissão do Mercado de Valores Mobiliários, or CMVM for short) approved the delisting of BPI in December, prompting CaixaBank to initiate the squeeze-out process. In November, CaixaBank unveiled its 2019-2021 Strategic Plan with the aim of putting technology at the service of customers and employees, while also strengthening its socially responsible banking model. The Plan envisions further transformations of the distribution network to offer greater added to customers, while strengthening the remote and digital customer relationship model and continuing to adding new products and services. 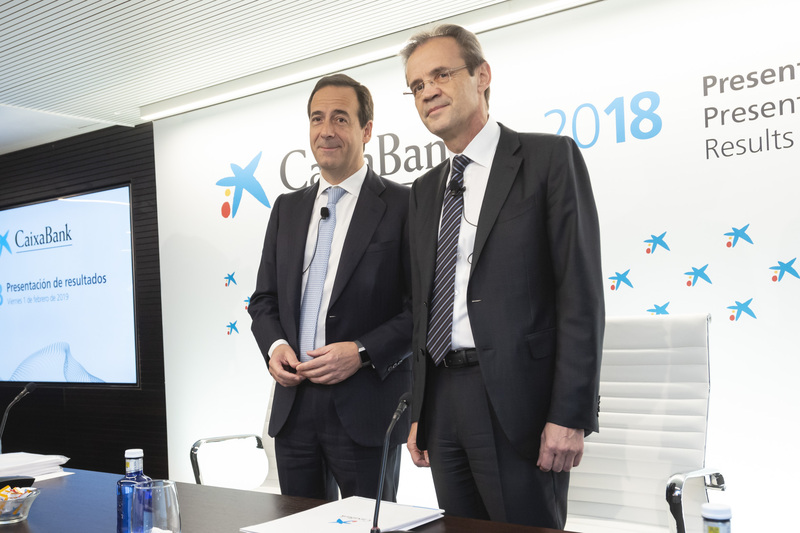 CaixaBank Group, the number one retail bank in Spain with Jordi Gual as Chairman and Gonzalo Gortázar as CEO, reported a net attributable profit of €1,985 million in 2018 (+17.8% versus 2017). CaixaBank’s profit in Spain amounted to €1,605 million (+6.4%). Driving this growth were strong core revenues, increased contribution from the BPI segment and lower provisions. Core business revenues (net interest income, fees and commissions, revenues from the insurance business, the result of using the equity method for SegurCaixa Adeslas, and the income from BPI’s stake in BPI Bancaseguros) were up 4.2% (to €8,217 million), while gross income gained 6.6% (to reach €8,767 million). Recurring administrative expenses, depreciation and amortisation grew by 3.7%, but were outpaced by core revenues. General expenses grew year on year, largely due to the transformation of the distribution model (“Store” branches, InTouch), increased spending on technology and new regulatory requirements. Pre-impairment income came to €4,109 million (+12.7%). Profitability at the CaixaBank Group (ROTE) improved to 9.3% —within the 9-11% target band envisioned in the Strategic Plan for 2018— while recurring ROTE from the bancassurance business was 12.3%, yielding a result of €2,199 million. The BPI business in Portugal contributed a total of €262 million to earnings (€104 million in 2017). Including the contribution of BPI’s investees, the total contribution made by the Portuguese bank amounted to €380 million (€176 million in 2017). The Group’s net interest income amounted to €4,907 million in the period (+3.4% on 2017), driven by a higher return on lending activity, intensive management of retail financing and lower wholesale funding costs. Fee and commission revenues came to €2,583 million, up 3.4% on the same period of the previous year. While banking services, securities and other fees were down 2.2%, fees on mutual funds, managed accounts and SICAVs gained 12.6% following an increase in assets under management during the first nine months of the year, although high levels of market volatility had a negative impact on assets under management in the fourth quarter, causing fees and commissions for this concept to shed 2.8%. Meanwhile, the cost-to-income ratio of the CaixaBank Group —accumulated over 12 months and stripping out extraordinary expenses— came to 52.9%. The core cost-to-income ratio (recurring operating expenses to core revenues) has gained 3.5 percentage points in the last three years to reach 56.4%. The equity investments business added €54 million to the Group’s profit (impacted by the loss of €453 million following the agreement to sell the stake in Repsol). Revenues from the total investee portfolio came to €972 million and include dividend revenues (mainly from Telefónica) and earnings at companies accounted for using the equity method, such as Erste Bank, SegurCaixa Adeslas, BFA and Repsol (without counting the impact of the stake’s disposal). The year-on-year improvement in earnings at companies accounted for using the equity method (+57%) was due to their sound business performance and to an increased contribution from BFA following a number of extraordinary impacts in 2017 and 2018. On one side, negative impacts in 2017 following BPI’s disposal of 2% of its stake in BFA (€-97 million) and on applying the inflationary effects of the Angolan economy to BFA’s financial statements (€-68 million). On the other side, a positive impact of €155 million was recognised in 2018 to reflect the extraordinary impacts caused, among others, by the devaluation of the Angolan currency. At year-end 2018, the Group’s significant influence at BFA was reviewed, giving rise to a change in the accounting classification of the investee (from Investments in joint ventures and associates to Financial assets designated at fair value through other comprehensive income). Due to the change, a result of €-154 million was reported under Gains/(losses) on disposal of assets and others (€-139 million, net), largely due to the result of valuation adjustments previously reported in equity. The net attributable contribution from BFA in 2018, after deducting the impact of the accounting reclassification, taxes and minority interests, came to €51 million. The NPL ratio of the CaixaBank Group dropped to 4.7% (6% at December 2017). NPLs fell to €11,195 million (€-921 and €-3,110 million in the quarter and in the year, respectively) in response to an active management, including the sale of portfolios. The coverage ratio climbed to 54% (+4 percentage points in the year) mainly impacted by the entry into force of IFRS9, which prompted the Bank to post a total of €791 million in provisions for credit losses). In the second quarter of 2018, CaixaBank agreed to sell its real estate business (mainly the portfolio of real estate assets available for sale at 31 October 2017, as well as 100% of the share capital of Servihabitat) to a newco, 80% of which was to be owned by Lone Star and the remaining 20% by CaixaBank. Following completion of the deal and thanks also to the intense commercial activity carried out during the year, the portfolio of foreclosed real estate assets available for sale came to €740 million (€-5,138 million and €-4,606 million in the year and in the quarter, respectively). Meanwhile, the portfolio of rental property amounted to €2,479 million, net of provisions, down €551 million in the year, which included the sale of rental real estate assets portfolio in the second quarter. Total real estate sales (excluding the deal with Lone Star) came to €2,060 million in 2018, up 28% on the same period of 2017. The non-core real estate business generated losses of €530 million in 2018, which saw various one-off impacts, particularly the repurchase of 51% of Servihabitat (€-204 million) and completion of the sale of 80% of the real estate business to Lone Star, which had a final negative impact on the income statement (including expenses, taxes and other costs) of €-48 million, net of tax. Loan-loss provisions and other charges were down 66.8% year on year to €567 million due to the ongoing process of normalising asset quality indicators. This heading includes impairment losses on financial assets, which dropped to €97 million (down 87.9% on 2017), and includes one-off revenues. It also shows other charges to provisions, which were down 48.4% to €470 million. In the second quarter, the repurchase of 51% of Servihabitat led to a result of €-204 million in the 2018 P&L statement (€-152 million registered in “Other charges to provisions” and €-52 million in “Gains/(losses) on disposal of assets and others)”. In 2017, it included €455 million associated to early retirements and €154 million in write-downs on exposure to the Sareb. Gains/(losses) on disposal of assets and others essentially comprises the results of completed one-off transactions and proceeds on asset sales and write-downs mainly relating to the real estate portfolio. The last quarter of the year shows the negative net result of €139 million resulting from the change in the accounting classification of the stake held in BFA, which was taken to “Financial assets designated at fair value through other comprehensive income”. In the previous quarter, it included a loss of €453 million deriving from the agreement to sell CaixaBank's stake of 9.36% in Repsol, through the early settlement of two equity swaps and after classifying the remaining stake as “Financial assets designated at fair value through other comprehensive income”. Following the entry into force of IFRS9 and in accordance with the Group's accounting policy, changes in the share price of financial investments recorded under this heading will be reported in equity (Other comprehensive income) and will have no effect on the income statement. The CaixaBank Group’s fully loaded Common Equity Tier 1 capital (CET1) ratio was 11.5% at 31 December 2018. Excluding the impact of -15 basis points due to the first-time adoption of IFRS9 and the extraordinary impact of -14 basis points in the year following the move to repurchase minority interests at BPI and the sale of 80% of the real estate business, the ratio gained 54 basis points from organic capital generation but shed -43 basis points in response to market volatility and other impacts. Meanwhile, total liquid assets totalled €79,530 million at 31 December 2018, up €6,755 million in the year. The Group’s average Liquidity Coverage Ratio (LCR) stood at 196% at 31 December 2018, well clear of the minimum requirement of 100% from 1 January 2018 onward. Total loans stood at €224,693 million at the Group and remained stable (+0.3% in the year), while the performing loan-book gained 1.8% in 2018 (vs. -1.2% in 2017, excluding the contribution of BPI) to reach €213,962 million. The improvement in the performing portfolio during the year was largely due to an increase in consumer lending in Spain (+19%) and in lending to businesses – productive sectors ex real estate developers- , which gained 6%. Loans for home purchases (-2.3% in the year and -0.7% in the quarter) continue to feel the effects of the ongoing household deleveraging process and the seasonal effect in the fourth quarter of end-of-year loan repayments, although the reduction in lending activity is now showing signs of slowing. In fact, new mortgage loans were up 9% on 2017. Customer funds grew to €358,482 million (+2.6% at year-end), despite sliding 1.4% in the fourth quarter, largely in response to negative market performance. On-balance-sheet funds totalled €259,423 million (+4.8% in 2018 and +0.3% in the quarter), revealing an annual increase of 9.8% in demand deposits to reach €174,256 million. The change in the fourth quarter (+1.3%) was partly due to the seasonal impact of year-end double salary payments. Assets under management amounted to €93,951 million. The change here (-2.7% in the year and -5.4% in the quarter) came largely in response to falling market prices, affecting the fourth quarter in particular. CaixaBank is continuing to strengthen its leadership in mutual funds, with a market share of 17%; and in pension plans, where its market share stands at 24.1%. In 2018, CaixaBank consolidated its leadership in retail banking by improving its market share across most segments, especially long and medium-term savings products, while achieving a market penetration of 29.3% among retail customers (up 1.1 percentage point). Meanwhile, CaixaBank continues to strengthen its leadership in the digital banking market, where it has the largest base of digital customers in Spain: 6 million (57.3% of the bank’s retail customers in Spain) of which 5.2 million are mobile banking customers. Digital channels are being used more and more to carry out transactions, thus allowing the CaixaBank to focus on providing quality advice through its 13,772 qualified advisers. To give an example, around 70% of premier banking and private banking customers now have an advisory services contract. Recently, CaixaBank was named ‘Best Digital Bank in Western Europe’ by British magazine Euromoney, and it has also received awards from The Banker and Bank Administration Institute (BAI) for its mobile app CaixaBankNow, a recognition to the Bank’s digital transformation and commitment to technological innovation. CaixaBank unveiled its 2019-2021 Strategic Plan on 27 November. The main lines of action are focused on offering the best customer experience; accelerating the digital transformation to boost efficiency and flexibility; fostering a people-centric, agile and collaborative culture; generating attractive shareholder returns and solid financials; and becoming a benchmark in responsible management and social commitment. The Bank aims to offer the best experience via any channel as it is fully aware of the general preference among customers for omnichannel services. The customer relationship model —and the resources dedicated to the different channels— is now evolving in response to changing habits. CaixaBank’s capillarity remains a competitive advantage and its move to transform the commercial network —by consolidating the “Store” urban branch model (with a minimum of 600 branches in 2021, a notable increase from the 283 in existence at the close of 2018)— together with its commitment to maintaining the AgroBank model in rural communities (over 1,000 branches in towns with fewer than 10,000 inhabitants), will make the CaixaBank even more in touch with new customer demands, while also helping to improve commercial efficiency, productivity and service. Meanwhile, CaixaBank will speed up the transformation of the branch network by implementing its specialised relationship model and it will also focus heavily on its remote inTouch model to reach a total of 2.6 million customers (up from the current figure of 600,000). inTouch is a service aimed at customers who prefer to use new technologies when dealing with the Bank. The initiative will combine new communication tools with the reliable backstop of a bank manager specially trained to resolve the customer's queries and doubts via any remote channel.